These days, many news outlets constantly discuss the continuing rise of two-income households where both parents work, leaving the children in daycare or with extended family. In reality, recent years have seen a rise in the number of mothers who stay home to take care of their children. In 2012, nearly 30% of mothers stayed home with their kids, compared to just 23% in 1999. The number of stay-at-home fathers is on the rise, too. In 2014, 16% of fathers reported staying at home — up from six men total in the 1970s. If you’re a stay-at-home spouse, you might wonder whether you really need life insurance. Your partner is the one responsible for providing the income, so you don’t need to worry about having money to take care of your family should the worst happen to you, right? Why Do Stay-at-Home Moms Need Life Insurance? As all stay-at-home parents know, you don’t spend your days lazing around the house doing nothing. You have to do a lot of work to take care of the kids and keep the household running. Women — especially stay-at-home moms — are behind men when it comes to getting life insurance coverage. A study conducted by the Life Insurance and Market Research Association (LMRA) found that only 52% of women have life insurance coverage, compared to 62% of men. And of those women with life insurance, their policies have 31% less dollar coverage than men. A big part of this gender gap is due to workplace benefits, such as group life coverage. Men are more likely to work at a job that offers group life coverage. And because group life is often tied to salary (and women still earn less than men), even the women who do have coverage still don’t have as much as men. Then there’s the myth that non-income-earners, like stay-at-home moms, don’t need life insurance. Even Bina West Miller, the pioneer for women’s life insurance, knew this was a myth back in 1891. You might not bring in income, but what you do provide is worth so much more than you think (more on that below). In short, women are uninsured or underinsured, meaning families are financially vulnerable should something happen to mom (you!). Fortunately, life insurance for stay-at-home moms can be very affordable. Life insurance can pay for way more than just funeral costs. Think about all of the things you do in one 24-hour period. With proper planning, you can leave behind a financial gift that can help pay for all of those things and more. Life insurance can help cover the cost of childcare should you pass away. While it’s true that stay-at-home moms might not bring in much income, you do cover a major expense in the family’s budget: childcare. The average cost of childcare in the US is $11,666 per child. Given that most families have trouble saving more than $500 for an emergency, hoping that your spouse can find an extra $12,000 in the budget each year to pay for daycare should you pass away is rather optimistic. Being a stay-at-home parent is a 24/7 job. Studies have shown that if stay-at-home moms earned a salary for the work they put into raising their child, they’d be paid $143,102 a year. You can think of that number as the effective income you’re bringing to the household, even if the money doesn’t show in your bank account. Homemakers tend to do more than just care for children, even though that’s a full-time job in and of itself. Most stay-at-home parents do things like laundry, house cleaning, grocery shopping, and cooking. These aren’t easy tasks. Think about what would happen if you were to pass away today: Your spouse and children would have a lot to deal with, emotionally and logistically. Not only that, your family will need a lot of help while they grieve, keeping up the day-to-day running of the home that they are now responsible for. Hiring help to do the laundry and ordering takeout or delivery food every day can get expensive very quickly. In fact, eating out or ordering delivery is as much as five times more expensive than eating a home-cooked meal. With a life insurance policy, the payout can help cover these increased costs and more while your family adjusts. As your family grows, so do your needs. Will your kids participate in extracurricular activities? Do they plan on going to college? You’re a stay-at-home mom now, but maybe you plan to return to the workforce later when your children are older (and more expensive). Would might your total household and income look like in 10 years? A life insurance policy can make sure your family can take advantage of every opportunity you planned for them, whether it’s now or decades later. How Much Life Insurance Do Stay-at-Home Parents Need? 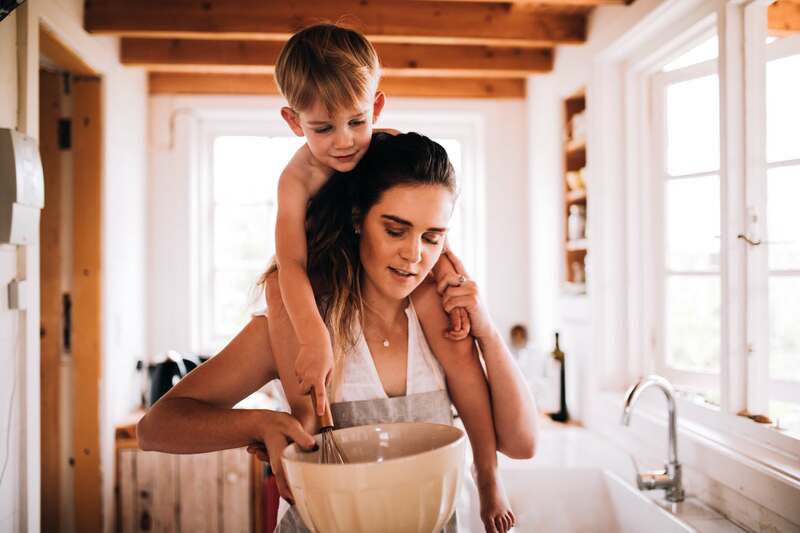 If you’re a stay-at-home mom or expecting to be a stay-at-home mom soon, there is a lot to consider when figuring out the amount of life insurance you should buy. After all, this is the amount (the death benefit) that you’d be leaving behind for your family should you pass away. It can also vary based on a number of factors, such as your family’s savings, household income, current and future expenses, and more. You can opt for just enough to cover end-of-life and burial costs, somewhere in the middle to keep your family comfortable for a few years, or even choose to leave behind a financial gift to pay for future expenses, like college tuition. It’s a personal decision that only you and your family can make. However, if you do need a little help, a (commission-free) financial planner can help you figure out how much life insurance would be good for your situation. Stay-at-home moms have an incredibly difficult job. Just because you don’t bring home a paycheck doesn’t mean that the work you do doesn’t provide value to the home. Protect what you’ve built in your home with a life insurance policy, and rest easy knowing your family’s financial future is taken care of. Are you a stay-at-home mom looking for life insurance? With Bestow, get up to $1 million in term life coverage in 5 minutes, no medical exam required. Get your quote now. TJ Porter is a Boston-based freelance writer specializing personal finance. He aims to provide actionable advice that can help readers better their lives. In his spare time, TJ enjoys cooking, reading, playing games (of the board and video variety), hockey, soccer, and ultimate frisbee.